Following on from the resounding return of their taster single ‘Lock Down’ earlier this year, South London trio Stooshe are firmly in the driving seat, ramping things up a couple of notches with the infectious new single ‘Let It Go’. Prouced by juNGLeboi and Dan Leary, ‘Let It Go’ is a true representation of the epic journey Stooshe have embarked on over the past 18 months, following their two top ten singles ‘Love Me’ and ‘Black Heart’ and top 10 album, ‘London With The Lights On’. The sound is a natural evolution of the group, but remains true to their pop, RnB and soulful beginnings. Alongside their new sound, the musical trio have grown into their own individual and unique image and style. Encompassing their street-style London roots with a sprinkling of elegance, the girls have channelled their boldness, sass and energy for their powerful musical renaissance. Stooshe comment, “’Let It Go’ is a feel good song that to us represents freedom, Summer vibes and most of all fun times. It was a written in a writing camp that we had organised to complete the album. Everyone invited that day worked really well together and the vibe was so electric. When we started, the creativity was unreal so the track just flowed. Stooshe are back, with more sass, spirit and confidence than ever! The video for ‘Let It Go’ is filmed by the turquoise sea on the Italian coast and directed by previous visual collaborator Damien Sandoval. The track is packed with a commandeering vocal and an anthemic, dance undercurrent, that’s set to infiltrate house parties, clubs and festivals, bringing good-time party vibes to the Summer of 2016. 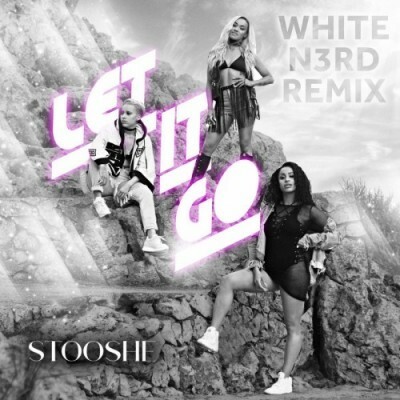 So hit the dance floor with Stooshe and…‘Let It Go’! This entry was posted in Reviews and tagged BLACK HEART, LET IT GO, LONDON WITH THE LIGHTS ON, REMIX, STOOSHE. Bookmark the permalink.